A few weeks back, we asked readers to help us pick the next title for us to discuss in Back Issues, our new feature in which two AVC writers crosstalk a comic-book series one collected trade paperback at a time. We were as not-at-all-shocked as anyone when Neil Gaiman’s Sandman series won, but the rest of the poll was telling as well, with Grant Morrison’s The Invisibles and Chris Claremont/John Byrne-era X-Men pulling a little more than 20 percent of the vote apiece. So here’s the long-term plan for Back Issues: Starting Tuesday, October 16, a rotating team of writers will take on the first six Sandman trades at a rate of one per week. We’ll take a break for the winter holidays, when we typically have so much holiday, year-end, and best-of content that anything else gets lost in the shuffle, and then we’ll return to Back Issues in 2013. Depending on the writers’ schedules, we may take an extended Sandman break at that point to tackle one of the other titles that polled strongly, or we may finish up Sandman first before moving on. But in the short term, those of you who want to participate in our little comic-book club should start reading: Oliver Sava and Noah Cruickshank will kick off the series by discussing the first volume, Preludes & Nocturnes (which covers Sandman issues #1-8) in less than two weeks. 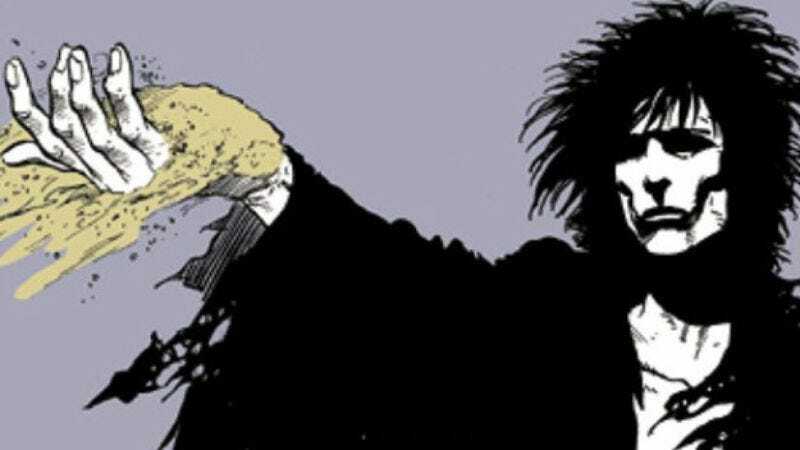 Why join in on reading or re-reading Sandman? Because it’s a groundbreaking series that opened up comics to a whole new audience, particularly women, twentysomethings, and first-time comics readers, during an era when the grim-and-gritty comics revolution of the mid-to-late ’80s was skewing comics fandom decidedly toward older male comics veterans. Its popularity spawned DC’s Vertigo Comics imprint, which experimented with a whole new range of experiments in comics that tended more toward horror, fantasy, and self-contained universes than superheroes operating in a gigantic shared world. It’s a creative, colorful, elegant, and hugely ambitious story that nonetheless focuses beautifully on small details and moments. And it made the name of author Neil Gaiman, as his first major project and his first to achieve widespread acclaim. It’s a foundational, load-bearing series for modern comics, and we’re going to talk about where it came from and how it affected the comics that followed. Come join us for the ride.